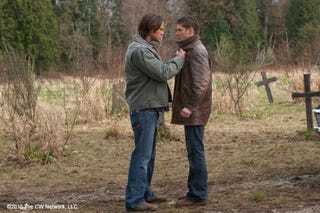 Last week, Supernatural ended with an apocalyptic season finale called "Swan Song" where angels fought Lucifer - and got audiences debating the true identity of God. We talked to showrunner Sera Gamble about what it all meant. io9: Did you guys change "Swan Song" at all after you got picked up for another season? Was that how you were always going to end the series? SG: We knew we were returning for another season well before Eric [Kripke] sat down to write the finale. So, the episode you saw was the story he worked on from the beginning. As for whether or not the episode resembles Eric's vision of the series finale, had the story ended there ... this is a great question for someone to ask Eric. I'd feel weird speaking for him about what was in his head. When I talked to you guys at Comic-Con back in the mists of time, [then-showrunner Eric] Kripke mentioned that we'd be meeting God this season. Does that mean we actually did meet God, and now we're left guessing about who it was (Chuck, Crowley, Joshua, etc.)? Or did you guys decide to leave God out of the picture? I love a good God debate, so it's nice to hear we got one going this season. We purposely left a bit of room for interpretation. Although many of your readers probably just read that sentence and rolled their eyes because they feel like we made it all very obvious by the end. Nobody thought it was obvious! Do you mean Chuck is the obvious answer, or that you really did leave it open? Don't ask me to squish the God debate! How many TV shows can say their fans are talking about THAT stuff? Can you give us any broad hints about what to expect next season? Anything. That was such an intense cliffhanger. We're dying here! We've been asked to maintain short-term radio silence re: season six teasers. So, raincheck on that. Well, it was a great season finale - we really loved it. It takes a village to explode Misha Collins like that. And in seriousness— I don't want to speak for everyone, but as someone who's been with the show since season one, the episode meant a lot to me.